Heart failure occurs when the heart is unable to pump enough blood and oxygen to support the body. According to the Centers for Disease Control and Prevention (CDC), approximately 5.7 million adults in the United States have the condition. Furthermore, research has shown that heart failure is a leading cause of maternal morbidity and mortality in the country. 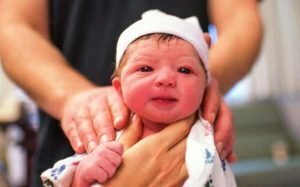 Researchers from the University of Illinois at Chicago now suggest that women are at the highest risk for heart failure within the six weeks after giving birth. These weeks are referred to as the postpartum period. On the other hand, the period prior to giving birth is known as the antepartum period. While the postpartum period saw only 1.5 percent of pregnancy-related hospitalizations, nearly 60 percent of heart failure cases occurred during the same period. This was followed by the period of delivery (which saw 27.3 percent of cases) and the antepartum period (which saw 13.2 percent of cases). “This finding lends support to using delivery-related hospitalization as a window of opportunity to identify high-risk women and develop surveillance strategies before discharge,” said lead author Mulubrhan Mogos, an assistant professor of nursing at the University of Illinois. The study titled “Heart Failure in Pregnant Women” was published in the journal Circulation: Heart Failure on Jan. 12. Jason Salemi from the Baylor College of Medicine and Mariann Piano from Vanderbilt University co-authored the paper. As a part of the study, the researchers analyzed more than 50 million pregnancy-related hospitalizations in the U.S. between 2001 and 2011. The women in the study were between 13 to 49 years of age. The results also identified vulnerable groups among women of reproductive age. Many of the women who received a heart failure diagnosis (prior to and after giving birth) were older and black. The study revealed that the women were from the southern states, lived in low-income household areas, and were involved in the use of drugs and alcohol. According to the researchers, the main takeaway is to encourage closer monitoring of high-risk women during the weeks after discharge. In most cases, once 2-3 days have passed after giving birth, women tend to be discharged from the hospital and will not be evaluated again until six weeks later.